Ready to lay and easy to use the EC mat offers a luxurious, and reliable solution to electric underfloor heating. Installing an ECmat in any room of your home creates that luxurious feeling a warm floor gives. ECmat can be installed under tiles, stone, laminate, carpet, wood and vinyl flooring giving you the ultimate choice in how you decorate your rooms. The ECmat is ideal to use on new builds and renovations, the mats are only 3.5mm thick, limiting the raising of the floor to the bare minimum. We recommend you install the mats on top of insulation boards to get the best out of your heating. 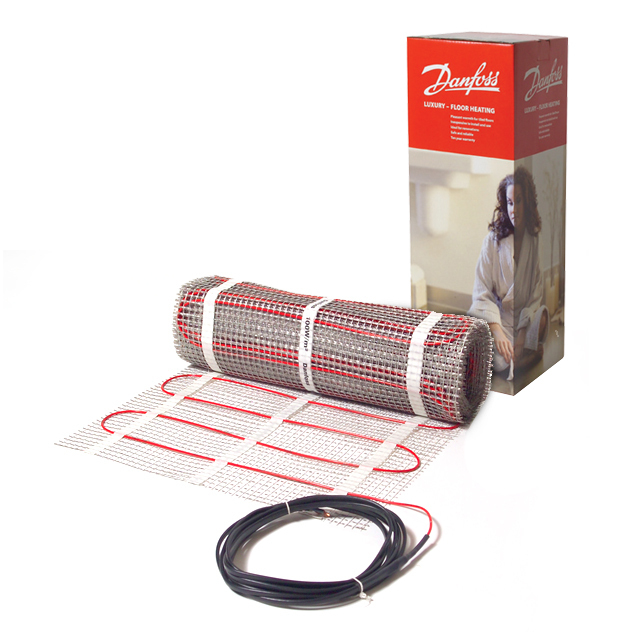 We are so confident of the quality of our Danfoss cables that every mat comes with our unique 20-year Danfoss warranty. This comprehensive warranty includes the cost of installation, the product and the flooring (please enquire for details). ECmats are exceptionally durable and fully compliant with the industry’s most important product standard: IEC 60800:2009. In addition, the mats can be safely installed at temperatures as low as -5 °C, the perfect feature to extend your installation season. The EC range of mats and thermostats are manufactured in our state-of-the-art factory. Before being packed ready for dispatch, every centimetre is minutely inspected and tested to ensure you get the best products to work with. The mats are ultra sticky and won’t move around while being laid making them easy to install. The visible cold lead connection make the mats suitable for almost any new build or renovation application. For added safety and durability, it also features a fully screened twin conductor with a single, easy-strip cold lead cable.